At a Menlo Park media event on Thursday, Facebook revealed the newest iteration of its mobile app for Android, Facebook Home, which company CEO Mark Zuckerberg says signals a shift in the way that people will interact with their computing devices. Facebook's new offering is a launcher, a program that can replace the standard interface on an Android phone, tweaking the look and function of the device to specific settings. In the case of Facebook home, the launcher reorients the device away from an app-centric interface and centers it around a user's contacts. Introducing Home, Zuckerberg said that reorientation was the main goal in its design. Among smartphone apps, Facebook stands far above the crowd, taking up 25 percent of its users' smartphone use time, according to comScore figures Zuckerberg displayed during the event. That focus on social  adding in Facebook-owned Instagram pushes the figure past 25 percent  means that the focus of mobile devices should change. "What would it feel like," Zuckerberg asked, "if our phones were designed around people instead of apps?" Facebook Home's primary interface changes are to the lock screen, home screen, and messaging features. 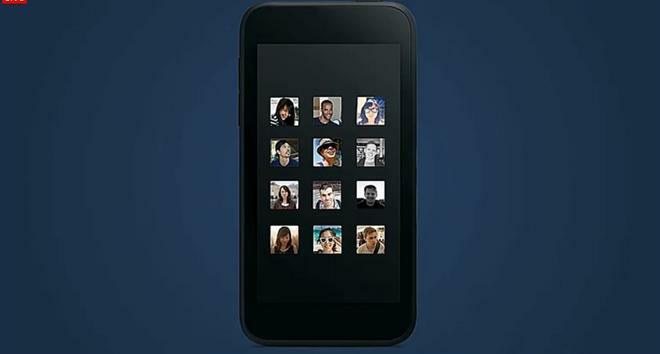 The lock screen will give users a continuous feed of their friends' status updates, with their Facebook cover photos as a background. Users can swipe between updates as they wish, and they can like photos or updates by double-tapping on them. 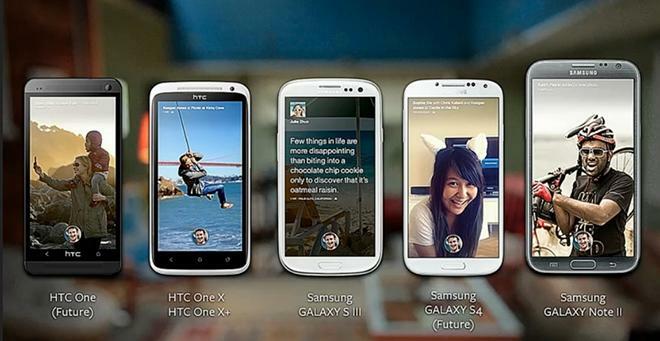 Facebook Home's primary interface changes are to the lock screen, home screen, and messaging features. Accessing a user's library of apps is accomplished by swiping from the lock button to the apps icon. This brings up a redesigned app tray, displaying available apps, but also along the top giving users the option to post a status update or take a picture to post to Facebook. 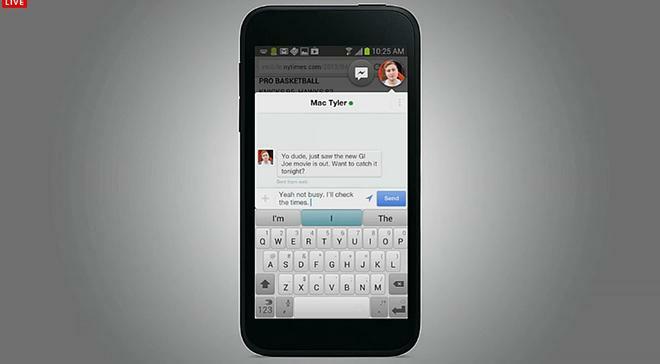 The messaging feature pulls in messages from both text messages and Facebook. Its main feature is called ChatHeads, and it functions by popping up persistent messaging icons for incoming messages. Those icons display the profile or stored picture of whoever sent the message. The icons remain visible even when a user switches between apps, and clicking on them pops up a messaging interface. Using gestures, users can reorganize or remove icons and chats. The new launcher will debut in the Google Play Store on April 12, and users of the most up-to-date Facebook Android app will see the option to try out Facebook Home pop up in their Facebook apps on that date as well. Facebook will, as with its other products, be updating Home on a monthly basis or faster. Initial compatibility for Home will be limited to six devices, including HTC's One and One X, as well as Samsung's Galaxy S III, Galaxy S4, and Galaxy Note II. 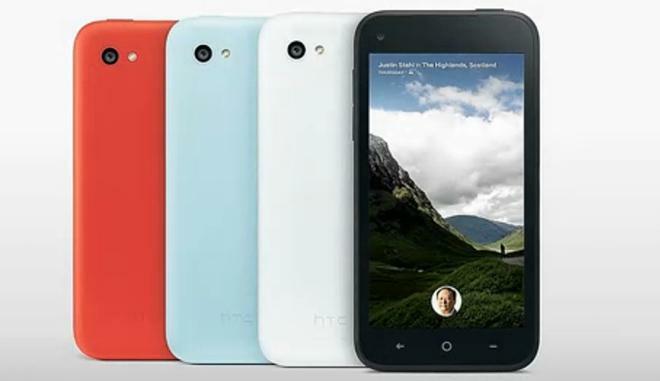 The sixth handset was the event's other announcement, the HTC First. Images of the First leaked in the days before the event, and Zuckerberg brought both HTC CEO Peter Chou and AT&T Mobility CEO Ralph de la Vega on stage in order to discuss the new handset. The First is billed as the phone built to optimize the Facebook home experience, though neither CEO went into much detail regarding which specifications made the device "optimized." A subsequent press release for the First notes that the device has Facebook Home preinstalled, with Instagram pre-loaded. It has a 4.3-inch display and runs Android 4.1 on a dual-core Qualcomm Snapdragon 400 processor, with the ability to connect to AT&T's 3G and 4G networks. The new HTC handset will be available on April 12 for $100, exclusively on AT&T, though Zuckerberg mentioned European carriers EE and Orange as future partners to stock the phone. Zuckerberg said that the Facebook home experience would be appearing on a number of devices from multiple manufacturers and featured on multiple carriers. Among those named off in the event were Samsung, Sony, ZTE, Lenovo, Alcatel, and Huawei.